36 n Performance & Hotrod Business n December 2014 PERFORMANCE and 15-year veteran of the Oxnard Police Department. "If they have something to do, they're not going to get into trouble." 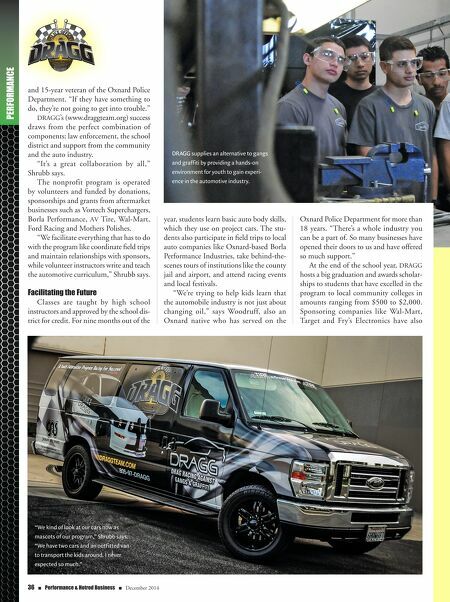 DRAGG's (www.draggteam.org) success draws from the perfect combination of components: law enforcement, the school district and support from the community and the auto industry. "It's a great collaboration by all," Shrubb says. The nonprofit program is operated by volunteers and funded by donations, sponsorships and grants from aftermarket businesses such as Vortech Superchargers, Borla Performance, AV Tire, Wal-Mart, Ford Racing and Mothers Polishes. "We facilitate everything that has to do with the program like coordinate field trips and maintain relationships with sponsors, while volunteer instructors write and teach the automotive curriculum," Shrubb says. Facilitating the Future Classes are taught by high school instructors and approved by the school dis- trict for credit. For nine months out of the DRAGG supplies an alternative to gangs and graffiti by providing a hands-on environment for youth to gain experi- ence in the automotive industry. year, students learn basic auto body skills, which they use on project cars. 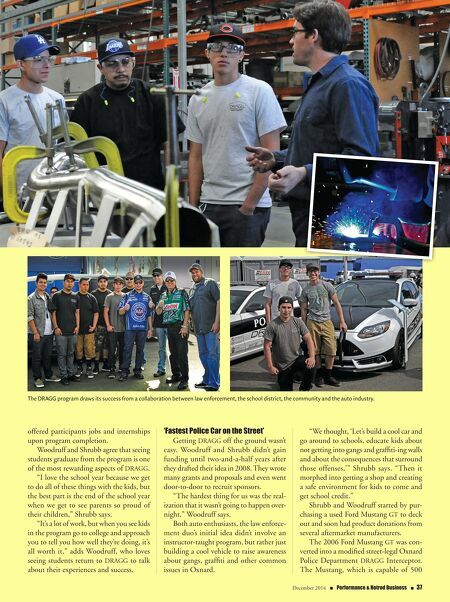 The stu- dents also participate in field trips to local auto companies like Oxnard-based Borla Performance Industries, take behind-the- scenes tours of institutions like the county jail and airport, and attend racing events and local festivals. "We're trying to help kids learn that the automobile industry is not just about changing oil," says Woodruff, also an Oxnard native who has served on the Oxnard Police Department for more than 18 years. "There's a whole industry you can be a part of. So many businesses have opened their doors to us and have offered so much support." At the end of the school year, DRAGG hosts a big graduation and awards scholar- ships to students that have excelled in the program to local community colleges in amounts ranging from $500 to $2,000. Sponsoring companies like Wal-Mart, Target and Fry's Electronics have also "We kind of look at our cars now as mascots of our program," Shrubb says. "We have two cars and an outfitted van to transport the kids around. I never expected so much."